Bend Area Christmas Parades will feature a number of Biblical floats that will take viewers from the angel visiting Mary, all the way to the empty tomb following the resurrection. 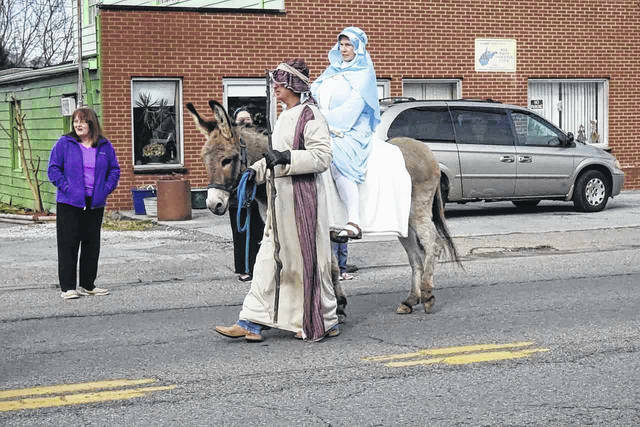 Pictured are Mary and Joseph traveling to Jerusalem in last year’s parades. BEND AREA — Those attending the Bend Area Christmas parades in both New Haven and Mason on Saturday will have the opportunity to view the true meaning for the holiday. For the second year, churches in the Bend Area will join to present a number of Biblical floats that will take viewers from the angel visiting Mary, all the way to the empty tomb following the resurrection. Pastor Donnie Dye of the Fairview Bible Church is the organizer of the floats. He explained why they will include more than the birth of Baby Jesus. The pastor emphasized while he organizes the event, it is the church congregations joining together to make it happen. He added he received many telephone calls after the inaugural event last year, and several said the floats made them remember why the holiday is celebrated. Northbend Church – The empty tomb. The parade will begin at 11 a.m. in New Haven, after lining up at the New Haven Community Building. It will continue to the former NAPA building. The Mason parade will begin at noon at the Faith Baptist Church parking lot and continue to the fire station. Due to the solemn nature surrounding the church floats, fire trucks will remain silent during the parades. Other Christmas activities in the Bend Area Saturday include visits by Santa in both New Haven and Mason, following their respective parades. Santa will visit children at the fire station in New Haven, where the children are invited to bring their letters and a canned food item for the Bend Area Food Pantry. In Mason, children will meet with Santa at the town hall. Treats will be given out at both locations. The annual New Haven Fire Department Ladies Auxiliary Christmas Craft Show will be held at the fire station from 10 a.m. to 3 p.m. It will feature many local craftsmen displaying their items for sale. Food will also be available to purchase in the fire station kitchen. The Letart community will hold its Christmas party Saturday at 1 p.m. at the Letart Community Center. Santa will arrive at 1:30 p.m. to hand out treat bags. There will also be crafts and games, and those attending are asked to bring a finger food and drink.